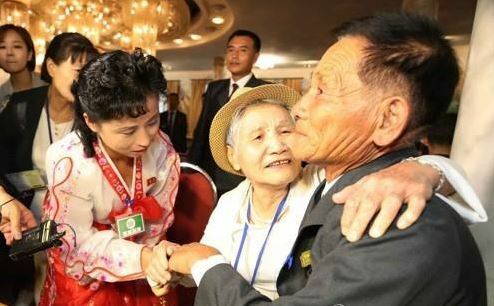 North Korea's state media reported Thursday on this week's reunions of families separated by the 1950-53 Korean War, calling them part of "practical" measures to enforce the April inter-Korean summit agreement to enhance cross-border ties. "During the first reunion held from August 20 and 22, the families and relatives from our side met their flesh and blood from the south and exchanged their inmost thoughts in a happy homely atmosphere," the North's Korean Central News Agency said in an English-language article. On Monday, 89 elderly South Koreans crossed the border into the North to attend the family reunions at the eastern scenic mountain resort of Kumgang, which were held for three days until Wednesday. They met 185 people from the North found alive in the impoverished country. A second round of reunions is set to take place from Friday through Sunday. A total of 83 North Korean people will meet their families living in the South. More than 330 South Koreans, mostly the elderly, will gather in the eastern city of Sokcho later Thursday, a day before traveling to Mount Kumgang by bus. Their first meeting with the North Koreans is scheduled to start in the afternoon. The South's related authorities are on alert for the possibility of a powerful typhoon having an impact to the event. Typhoon Soulik is on track to sweep across the peninsula Friday, according to weather agencies. Around 40 officials from the government, the Korean Red Cross and Hyundai Asan, a firm which built facilities in the region to help facilitate South Koreans' visits there, are double-checking the meeting venue and hotels, the Ministry of Unification said.